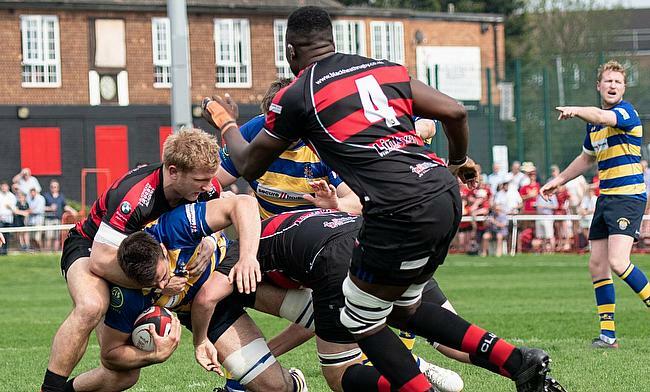 Blackheath host Old Elthamains at Well Hall on Saturday in one of the many derbies taking place across the National Leagues in Round Two. ‘Club’ face their local rivals following a convincing win over Esher on the opening day of the National One season while OEs make the 10-minute journey off the back of an excellent victory against Rotherham Titans. Also towards the top end of the table at this early stage of the campaign, newly promoted Chinnor will be aiming to back up their wonderful triumph over Plymouth Albion when second placed Ampthill & District visit Kingsey Road. Elsewhere, Rosslyn Park and Darlington Mowden Park will also be looking to build on their wins from Round One while 10 other teams will be aiming to get off the mark this weekend. It’s derby day in Round Two this weekend as local rivals Blackheath welcome Old Elthamians to Well Hall. The hosts picked up an excellent away win to kick off the season as they eased past Esher with former Bedford Blues player Elliot Clements-Hill starring on his debut. James Shanahan’s men finished fifth last term and a place above their neighbours Old Elthamians and both will have ambitions of climbing the league this year. The visitors seem to have that mindset after a wonderful opening day victory away at recently relegated Rotherham Titans. Last season, Blackheath edged OEs 28-23 so Gavin Lach’s side will be hoping for the bragging rights this weekend. Last time Chinnor played a competitive match at Kingsey Road, it secured their place in National One. Matt Williams’ side beat Sedgley Park back in May to seal promotion to the third tier and what a start the Black and Whites have made to their debut season at this level. An excellent win away at promotion contenders Plymouth Albion was a brilliant result and they will be aiming to repeat that feat this Saturday against another side eyeing the title. After three consecutive top four finishes, this could be Ampthill & District’s year in National One. The A’s produced a controlling performance to see off Loughborough Students in Round One and the Bedfordshire outfit will be keen to double their tally of wins this Saturday if they are harbouring Championship hopes. After a tough season last year, Rosslyn Park would have been pleased to begin the new campaign with a victory. Kieran Power’s men beat newly promoted Cinderford away from home to secure their first victory on the road since January and this weekend, they are back on home turf as they welcome Bishop’s Stortford to the Rock. Stortford were narrowly beaten by Darlington Mowden Park in Round One, but it was an impressive display from Andy Long’s side who finished eighth last year. The men from Silver Leys will now be hoping to harness that positive performance this weekend as they look to triumph in South West London for the second year on the spin. Two title candidates clash in the North East this Saturday as Darlington Mowden Park host Rotherham Titans. The home side, who finished as runners-up last year, grinded out a win at Bishop’s Stortford in Round One and a victory on their own patch against Rotherham on Saturday would be a statement of intent from Danny Brown’s men. The reason for that is because Rotherham came down from the Championship and after such a long spell in the second tier, the Yorkshire side will want their time in National One to be as brief as possible. A new era has begun at Clifton Lane under Joe Barker and with a lot of new faces moving to the Titans, it will take time for them to click. A defeat against Old Elthamains last week highlighted this point, but victory against last season’s silver medallists would certainly kickstart their campaign. Two seasons ago, Sale FC and Caldy battled it out for the title in National Two North and now they face each other in the third tier this weekend. Caldy travel to Heywood Road on the back of a very satisfactory maiden campaign in National One and they began this term with a hard-fought win over Birmingham Moseley last Sunday. Simon Verbickas’ men will be keen to build on last season’s achievement whilst Sale FC may want to take a leaf out of Caldy’s book. After clinching the National Two North title in April, Jonathan Keep’s side started the latest chapter in the club’s history with an enthralling 36-36 draw away Cambridge last weekend. In truth, Sale may have been frustrated to see a 21-point lead evaporate in the second period, but now they are back on their own turf this weekend and they have won 29 of their last 30 games at Heywood Road. The last team to beat them? Caldy back in December 2016. As mentioned above, Cambridge kicked off their season with a see-saw contest against Sale FC in Round One. In Richie Williams’ first game in charge of his new side, the Blood and Sand battled back from a below-par first half performance to rescue a share of the spoils at Volac Park so Williams and his team will be aiming to put in a much more complete display against Loughborough Students this Saturday. Loughborough and Cambridge were separated by just six points last season, but the Students were very much embroiled in a fight for survival. Alan Buzza’s men survived the drop and put up a strong battle against Ampthill and District to start the new season. They were defeated, but came away from Dillingham Park with a try bonus-point and now the Midlands side will be aiming to claim their first victory of the season as they look to get off the mark as quickly as possible. Cinderford’s return to National One nearly saw them claim a victory at home to Rosslyn Park, but they narrowly missed out on the perfect start to life back in this division. Paul Morris’ side did come away with two points and now they will be aiming for their first win at this level since April 2016 when they take the trip to Birmingham Moseley. Not long to go until our first home game of the season! As for Moseley, they were moments away from clinching an opening day victory against Caldy last weekend. A late Josiah Dickinson try snatched the result from them so at Billesley Common this Saturday, Richard Protherough’s side will be keen to find their first win of the new campaign. It is of course very, very early days in National One but the division’s bottom two sides meet at Molesey Road this weekend with Esher hosting Plymouth Albion. Albion suffered a surprising opening day defeat at home to newly promoted Chinnor which was not the start Kieran Hallett’s side were looking for following back to back third place finishes in National One. They will be keen to put that defeat to the back of their minds when they travel to Surrey this weekend to face an Esher side who were also beaten at home in Round One. Rickey Nebbett’s men were outclassed by Blackheath last weekend and face another tough assignment this Saturday. Eight of Esher’s 11 wins last season came on their own patch so they will be eager to get off the mark in front of their own supporters in Round Two.